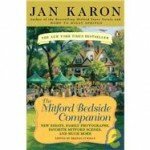 This book rounds off the nine novels that make up the Mitford series about life in a small town in North Carolina, USA. As I had thoroughly enjoyed reading the series, I put in a request with Laurieton library staff to purchase this companion book, and I have not been disappointed. Whilst the central character of the Mitford series if Father Tim Kavanagh, a 60-something Episcopalian priest, they are not 'religious' books with ponderous sermonising; rather the stories about his interaction with the characters that inhabit Mitford and other parishes. Each novel is peppered with wonderful characterisations, jokes, and insights into human behaviour, with the ongoing themes of forgiveness and redemption. 'The Mitford Bedside Companion' contains a wide selection of the best of the best from the Mitford series and is a delightful read, so if you are unfamiliar with the series, this book may be a good place to start getting to know the many and varied characters that inhabit Mitford. Share lunch and ideas for sharing stories with children. Join Storytellers, Pat and Peter Dargin and listen to stories and learn easy ways to share stories.